"Deirdre McCloskey’s unfashionable, contrarian, and compelling manifesto in favor of what she calls the bourgeois virtues starts with an uncompromising ’apology’ for how private property, free labor, free trade, and prudent calculation are the font of most ethical good in modern society, not a moral threat to it. . . . Ms McCloskey is spectacularly well read. She can pull an apposite quotation not only from her heroes, such as Adam Smith and Thomas Aquinas, but also from Thucydides and Machiavelli, or from the anthropologist Ruth Benedict and the contemporary philosopher Alistair MacIntyre, or (for that matter) from the movies ’Groundhog Day’ and ’Shane.’ What is more, she writes with wonderful ease. Her style is conversational and lively, sometimes even cheeky, so that even the toughest concepts seem palatable." 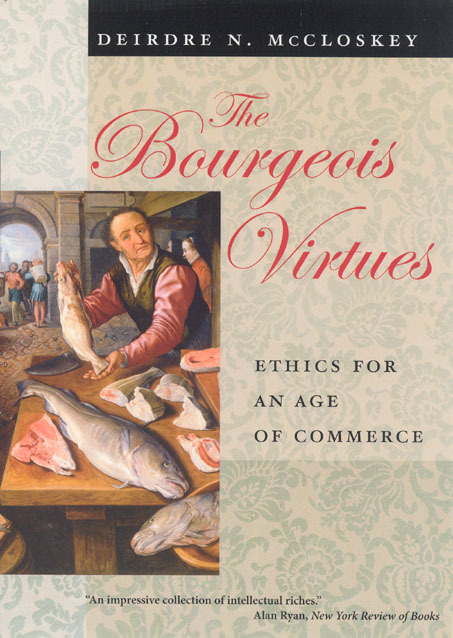 "A significant contribution to the study of the moral basis of economic life and thought. McCloskey has woven many sources and a number of traditions together to provide the beginnings of an argument and discussion of the role of virtues in economic life. Her approach intersects with, but also challenges, ongoing steams of research in the areas of behavioral economics and social, cultural, and institutional economics, and her vision is original." "This book is unfair in many ways. For all the seriousness of the content, it is written in such a beguiling manner that the reader is seduced into reading for sheer enjoyment rather than dutifully putting together wisdom and enlightenment." "This is an admirable start to a bold project. Readers will find the extensive citations from literature, art, and history entertaining and informative, and the scope of the study should provide food for thought on a wide range of topics.. Most importantly . . . it illuminates the question at the heart of current debates over the marklet system and how it affects people."